Three residents of the Olympic Peninsula have filed a class-action lawsuit challenging the U.S. Border Patrol’s practice of stopping vehicles and interrogating occupants without legal justification. Filed in U.S. District Court in Seattle, the lawsuit says that the Border Patrol’s suspicionless stops on the Peninsula violate constitutional rights, and it seeks a court injunction barring such unlawful stops in the future. The Northwest Immigrant Rights Project (NWIRP) and the ACLU of Washington are representing the residents and will seek class-action status for the suit. “The Border Patrol’s actions have created a climate of fear and anxiety for many people living on the Olympic Peninsula. The residents in this suit all are U.S. citizens who worry that they could be stopped and questioned without reason any time they drive or are passengers in cars. We’re asking the court to put in place safeguards to stop the Border Patrol’s unlawful and unfair practices,” said Sarah Dunne, legal director of ACLU. “People are being stopped based solely on their appearance and ethnicity. This is unlawful and contrary to American values. No one in a car should be stopped and interrogated by government agents unless the law enforcement officer has a legal basis to do so,” said Matt Adams, legal director of NWIRP. The lawsuit seeks a declaration that the Border Patrol’s suspicionless stops violate the Fourth Amendment and exceed the agency’s legal powers. 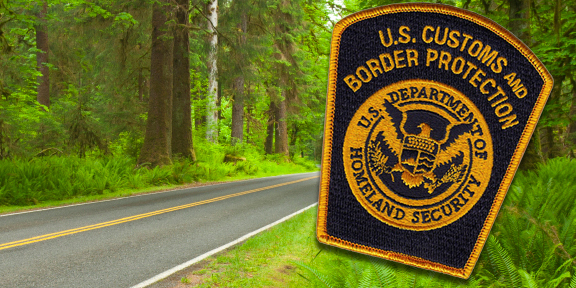 The suit seeks to prohibit Border Patrol agents from stopping vehicles without reasonable suspicion that an occupant has entered the U.S. without approval. It also seeks to prohibit stops altogether until each agent on the Olympic Peninsula has received training regarding what constitutes reasonable suspicion for a stop. The suit would have the court require that Border Patrol agents prepare documentation recording the basis of their suspicion that justifies each stop. Furthermore, the documentation should be easily accessible to a court-appointed special master to monitor compliance. The plaintiffs have experienced unwarranted stops and interrogations in a variety of settings, all while going about their daily lives. Agents provided flimsy pretexts or no reason at all for the stops. Some stops appear to be based on nothing but the Border Patrol agents’ perception of the plaintiffs’ ethnicity or the color of their skin. The incidents are typical of troubling encounters which many residents of the Peninsula have had with Border Patrol agents. Jose Sanchez is a resident of Forks and correctional officer for the Olympic Corrections Center. In 2011 in Forks, Border Patrol agents stopped the vehicle he was in, saying its windows were too dark – even though the driver’s side window was not tinted. The agents questioned Sanchez – a U.S. citizen – about where he was from. In an earlier incident, Sanchez and a family member were traveling in a vehicle near Forks, when Border Patrol agents stopped the car and interrogated him about his immigration status. Though agents told him that his vehicle was stopped because its windows were too dark, the agents did not ask for his insurance or registration. When he provided those documents, the agents refused to inspect them. In yet another incident at Forks, Sanchez was traveling home in a vehicle which was followed by Border Patrol agents. When he arrived at his house, the agents approached him. But when Sanchez began to record the encounter with his cell phone, the agents backed away. Ismael Ramos Contreras is a resident of Forks and a senior and student government body president at Forks High School. In 2011 at Port Angeles, he was traveling in a vehicle with several teenage friends to pick up tuxedos for a Quinceañera (15th birthday) celebration when the vehicle was stopped by four Border Patrol agents. One agent tried to take the key out of the ignition, so the driver handed him the key. Agents interrogated the boys about their immigration status, but never provided a reason for the stop. In an earlier incident in 2010, while walking out of the Clallam County Courthouse in Forks with his mother, Ramos Contreras was approached by a person who addressed him by name and began questioning him about where he lived and came from. Based on the questions, his mother identified the person as a Border Patrol agent; the person indeed turned out to be an agent who was in plain clothes and wearing their badge backwards. Ernest Grimes is a resident of Neah Bay, a correctional officer at Clallam Bay Corrections Center, and a part-time police officer. In 2011 near Clallam Bay, a Border Patrol agent stopped the vehicle in which Grimes was traveling, approached with his hand on his weapon, and yelled at Grimes to roll down his window. Without offering a reason for the stop, the agent interrogated Grimes about his immigration status. Grimes, who is African American, was wearing his correctional officer uniform at the time. Representing the plaintiffs are NWIRP legal director Matt Adams, ACLU-WA legal director Sarah Dunne and staff attorney La Rond Baker, and cooperating attorneys Nicholas Gellert, Brendan Peters, Javier Garcia, and Steve Merriman of the firm Perkins Coie LLP.